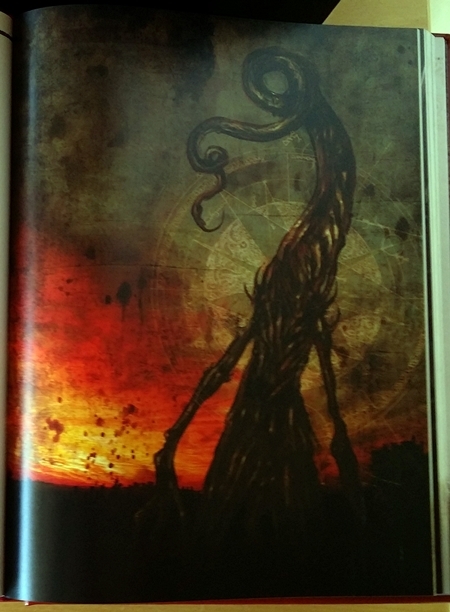 Hot on the heels of yesterday’s tremulus retrospective, in which I said “All of that combines to facilitate Lovecraftian horror so well that as much as I love Call of Cthulhu, I’m pretty sure I’d reach for tremulus first,” my Kickstarted copy of Call of Cthulhu 7th Edition arrived last night. Estimated Kickstarter delivery: November 2013. So there’s that. One of two straws which apparently nearly bankrupted Chaosium, one of the oldest and most storied companies in the RPG industry. So there’s that, too. But there’s also this: It’s the 7th edition of one of my most-loved RPGs of all time — the one that gave me my first horizon-expanding “Whoa, what? !” realization about RPGs in general. That was back in 1992 or so, and I’ve been playing Call of Cthulhu (and reading Lovecraft) ever since. That’s also when I learned that I was missing more editions than I thought, and just how out of reach the missing ones really were. I stopped collecting them then — or at least made peace with the fact that my collection would never be complete. 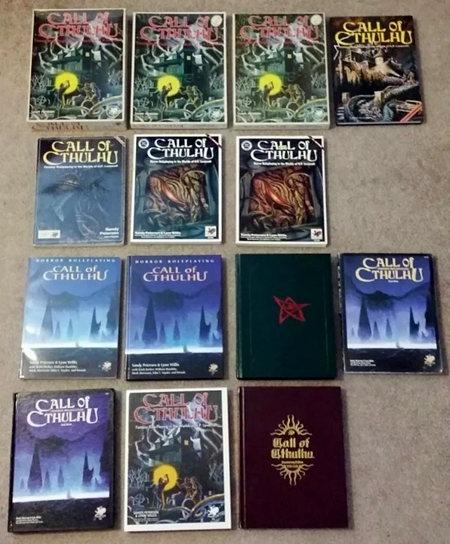 Part of what I enjoy about collecting copies of CoC is the irony: For six editions spanning 30 years, CoC has been a game that really doesn’t change much from edition to edition. You can play any 1st through 6th edition scenario with any edition. 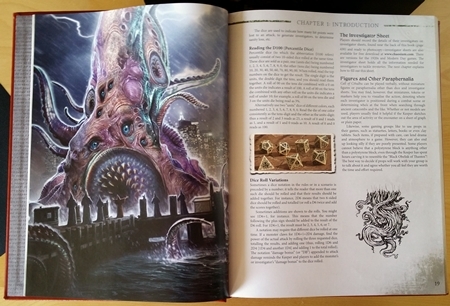 7th Edition is the first one that promised more of an overhaul — maybe not as dramatic as the shifts between major editions of D&D, but more dramatic than any non-cosmetic edition changes Chaosium has made in the past three decades. I can see where a lot of the budget went: into the artwork. Here are two of my favorite full-color pieces. The spot-color pieces are great, too. As is the layout. Production values are top-notch across the board. 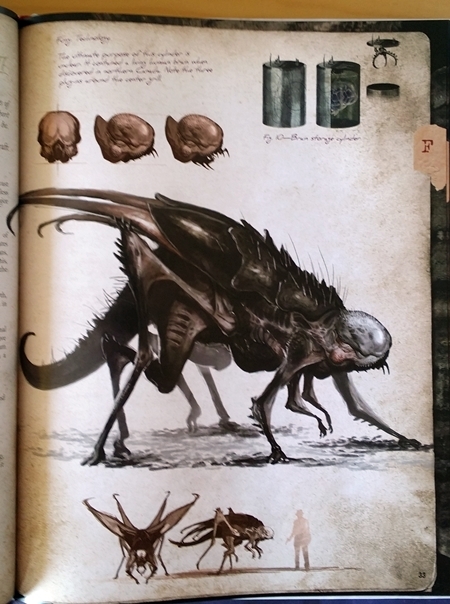 That extends to the non-core books, too — here’s one of my favorite creatures, and illustrations, from the new Field Guide. 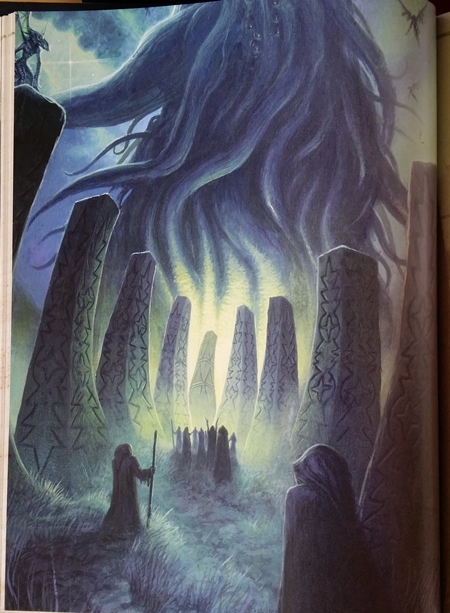 A lot of the creatures are like that: more artistic, interpretive takes on classic Lovecraftian entities. I like this mi-go, and I like many of the others, too. I went in for the leatherbound edition (as well as the softcovers — I was still collecting editions when I pledged for this), and man are they gorgeous. As pretty as the books are, though, I’m not sure I love the quantity as much as I love the quality. My favorite edition, 4th, comes in at 192 pages. The most recent edition I have on my shelf, the 30th Anniversary Edition, is 320 pages. 7th Edition is two books, rather than one: a 448-page Keeper Rulebook and a 288-page Investigator Handbook. At 736 total pages, that’s a 544-page increase over 4th, and 416 pages more than the 30th Anniversary rules. 2016 Martin isn’t nearly as excited about huge rulebooks as 2013 Martin was, and even 2013 Martin was cooling on them. The amount of pure, unfiltered joy I get out of, say, Psi-Run, which is a whopping 60 digest-size pages, sets a pretty high bar in terms of reading/work/rules:fun ratios. I spent some time last night documenting damage and contacting Chaosium about it (not a problem unique to my shipment, unfortunately, but they seem to be on top of it), and I’ve got an — unrelated — splitting headache as I type this, so that’s where I’m going to stop for now. It’s a lot to take in. A heady brew, long overdue, and, unexpectedly, I’m less confident that Call of Cthulhu is my go-to game for Lovecraftian horror than I was when I backed it three years ago. I need to spend some more time with these books. As a kid, I mostly played D&D and similar games. CoC flipped those on their heads by encouraging players to embrace the frailty of their characters and have fun descending into madness and death, fighting against impossible foes, rather than cunningly evading the grim reaper at every turn. It blew my mind. The last time I saw one of the convention editions for sale, it went for $600. 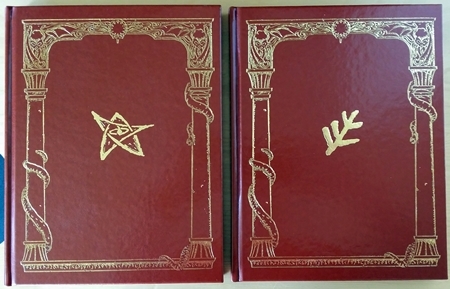 And the 7th Edition Kickstarter offered a $1,000 pledge level that included a hand-bound Temple Edition copy of the rulebooks. The cosmetic differences are fun, though, and the presentation has gotten slicker and more polished over the years. It’s the rules that basically stay the same. I ponied up for the pdf GM manual a couple of weeks ago, but only after much debate and telling myself I didn’t need it. I honestly feel that the game had been turned from a GM’s delight to a GM’s nightmare over the years as the rulebooks came to resemble more and more the disorganized Mythos Tomes it deals with, and I’ve been having more fun with the D20 version that puts the Tomes back within reach of the players (and thereby tempts them down a very dark path with very amusing results – for the GM). But that rant you’ve already read several times over at the stew. What got me was the way the Kickstarter for this (and for HotOE) was obviously in severe trouble and yet customers seemed to have Stockholm Syndrome and were falling over backwards to make excuses for “Charlie” (who has not been mentioned anywhere I can find by name since the new management team rode in to save the day and kickstarted him on a new career path). The reason I found this interesting is that I was watching the same behavior occur on a kickstarter I joined at about the same time the 7the ed one started, this for a $100 3d printer. A maker/developer toy, you understand, not a serious contender for Makerbot 2016. And, just as with the Chaosium Kickstarter, it turned out the money was gone and there were no products to ship and progress was measured by then in column inches rather than milestones. I had given up reading the printer kickstarter updates many months before as I could detect the stench of mendacity (and, as it turns out, outright theft) coming off them. I am enormously happy on others’ behalf that the CofC projects were saved from what I suspect was a journey well on the paved road to Ye Veriest Horror. I’ll be reading your observations of this version with interest to see if they gibe with my own. 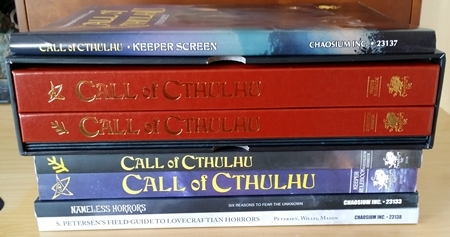 For now, at least, CoC 7e is sitting in my “ingestion pile,” but I don’t have any interest in digging further.